Once you arrive at your Nashville meeting location (Anderson Road Recreation Area - Boat Ramp), you will be greeted by your host. 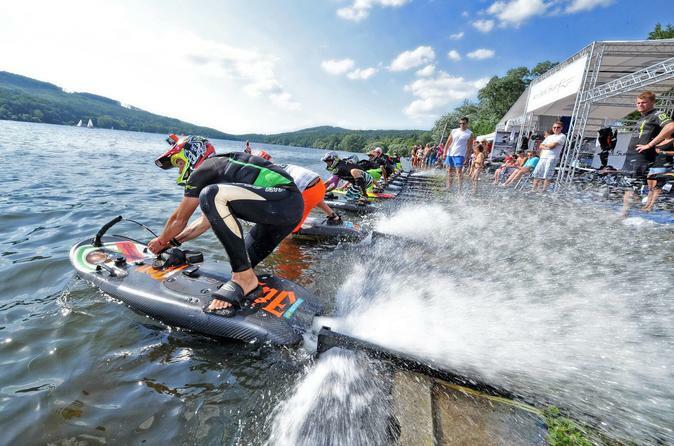 As you lay your eyes on the state of the art carbon fiber boards, your host will begin to learn a little about your personal background in water sports. He will then go over basic safety information, and get you outfitted with the right size CGA Life Jacket, and a safety helmet. Once outfitted, you will begin an on ground training on how to start the board, and how to stand up on the board. Your host will do a demonstration ride on the water, displaying the procedure you learned on ground. Now you are prepared and ready to head out in the water and experience Jetsurf for yourself. Your riding time can be shared among participants as desired by the group, or split it evenly between the number of participants. Lesson for 1 person lasts 1 hour total. 1 hour lesson for 2 lasts 1 hour (30 min. each). Lessons for 3-4 people last 2 hours using 2 bards (1 hour or more each).